Western Australia's 12,000 km (7,450 mi) of coastline is broken up only by oasis-like towns and cities. Most of the state, however, is an arid region of mostly uninhabited, infertile land with an untamed physical aesthetic. The harsh climate cultivates a laid-back lifestyle centered on the coast's shaded enclaves and picturesque beaches. Australia's largest state, with an area of 2.65 million sq km (1 million sq mi), Western Australia contains over a third of the country's landmass but just 11 percent of its population. Perth: One of the most geographically isolated cities in the world, Perth nevertheless offers a relaxed metropolitan vibe and pleasant natural scenery, and serves as a hub for most trips to Western Australia. Broome: Known for its pristine beaches, warm weather, and camel rides, the northwestern coastal town of Broome has evolved from a pearl-fishing hub to one of the most visited destinations in Western Australia. Margaret River: Quality wines flow from Margaret River, a laidback town on the southwestern tip of the continent that, thanks to its beautiful scenery, is one of the undisputed highlights of Western Australia tourism. Fremantle: Formerly a colonial settlement for British convicts, Perth's southern port district of Fremantle has turned its image around completely and is now known as the city's trendiest suburb. 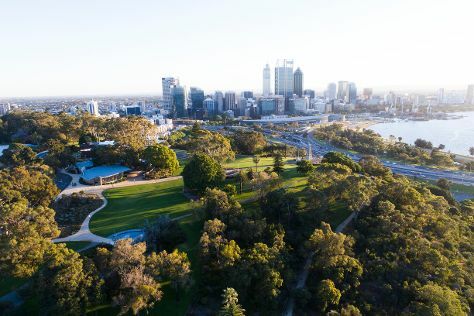 Kings Park & Botanic Garden: No other space sums up the laidback, nature-infused vibe of Perth better than these gardens, which offer views over the city center and the river that nourishes it. Fremantle Prison: Add this World Heritage Site to your Western Australia itinerary to get a taste of what life was like during the colonial days, when British convicts arrived and established their settlements in this remote part of the world. Swan River: Winding its way through the heart of the city to meet the Indian Ocean, this picturesque river serves as the lifeblood of Perth and offers great spots to stroll, sail, or swim on hot days. Busselton Jetty: Walk over water as you head out on this old-fashioned wooden pier, which extends more than 2 km (1.2 mi) out into the deep blue. The Perth Mint: It's all about gold at this historic Western Australia attraction, which provides fascinating insight into the mining rush of the 19th century, and even offers you the chance to see molten gold molded into an ingot. Perth Zoo: You can see all the famous local animals--kangaroos, koalas, Tasmanian devils, and even quokkas--at this expansive zoo, known for its open, scenic "bushwalk" tour. Cottesloe Beach: The laidback Perth lifestyle shines through at this wide beach, where locals gather to play cricket on the foreshore and star-crossed lovers settle in to watch the romantic sunset. Cable Beach: Take a camel ride along this popular expanse of coastline during your Western Australia holiday and you'll be rewarded with a memorable sunset looking out over the seemingly endless horizon. Kings Park War Memorial: Pay your respects to those who lost their lives in the World Wars at this somber but striking memorial, which represents the tomb of an unknown soldier and offers views over the Swan River. The Pinnacles: Thousands of cone-shaped rocks protrude from the desert in this bizarre landscape, which has developed into one of the most iconic attractions in Western Australia. A strong emphasis on nature and outdoor pursuits mean that most destinations in Western Australia offer a plethora of family-friendly options. Start in Perth, where you can take the kids to a range of parks, beaches, and wildlife centers to keep them entertained and educated. While in the big city, make sure you pop down to Fremantle, where you can visit the docks and admire boats and ships about to embark on journeys to exotic corners of the globe. Next on your Western Australia itinerary, head north to Broome, where the kids will have a blast with a camel ride along Cable Beach. Your family vacation in Western Australia will get off to a great start in Perth, a city of nearly two million people that caters to visitors of all ages. Beat the heat at Adventure World, an adrenaline-pumping water park where the little ones can run amok, or head to Perth Zoo to introduce the kids to some of Australia's most famous animal species. The opportunity to embark on a bumpy camel ride at Cable Beach will complete your memorable Western Australia vacation. Always check with locals before swimming at any beach--while shark attacks remain very rare and usually only occur in deeper water, they can still be a risk if you swim at an unpatrolled spot. Cable Beach is notorious for jellyfish during certain times of year, so make sure you check before letting the little ones swim. Remember to bring plenty of insect repellent and cover the kids in sunscreen and sun-smart clothing during your trip to Western Australia, as the already-fierce Australian sun can be particularly potent in the west. The region's strong agricultural traditions and expanses of farmland mean you can enjoy plenty of excellent, locally grown food during your vacation in Western Australia. When you visit cities and towns along the region's 12,000 km (7,450 mi) of coastline, you can sample some of the world's freshest seafood, including salmon, trout, lobster, and prawns. Add some inland destinations to your Western Australia itinerary and you'll find a multitude of farms selling all manner of fresh fruits and vegetables. The multicultural atmosphere of Perth means you can find all kinds of international cuisine, with particularly strong influences from nearby Asia. Complete your Western Australia holiday by journeying south to Margaret River, where you can sample some of Australia's finest wines. As the only real city in this part of the country, Perth, not surprisingly, offers the best range of shopping options in the region. You'll find all manner of international brands at large shopping zones, such as London Court and Sportscraft Watertown Brand Outlet Centre. Alternatively, you can add Fremantle to your Western Australia itinerary to browse through some of the city's trendiest shops and boutiques. If heading on a road trip during your Western Australia vacation, remember to stock up on supplies in cities or regional centers. In the more remote parts of the region you might have to drive for hours to the nearest shop, where prices can be extremely high. As well as marking other nationally recognized public holidays, Western Australia celebrates its own day on the first Monday in June, aptly named Western Australia Day. If you take a trip to Western Australia on that day, you'll see festivities, live music, and other artistic performances in the streets of Perth. Plan your Western Australia holiday for the warmer months--between November and March--and you can catch some popular music festivals featuring well-known local and international artists. The most visited festivals include Southbound in January, Laneway Festival in February, and Stereosonic in November. The region's massive size, and variation from tropical north to temperate south, means you can experience quite different climates depending on where your Western Australia itinerary takes you. Southern coastal areas enjoy a mild Mediterranean climate, with warm summers, cool winters, and plenty of sunshine. A few hours farther north, you'll find slightly hotter weather with plenty of sunshine. In Broome, the most popular tropical Western Australia destination, you'll encounter a mix of hot weather and thunderstorms between October and March, with a pleasant dry season between April and September. Tourism in Western Australia tends to focus on the coast, with much of the inland expanses covered in harsh desert landscape. Harsh conditions, long distances between settlements, and a staggering amount of "empty" space can present problems when getting from place to place on a Western Australia holiday. Within Perth, you can make use of a well-connected public transport network consisting of buses, ferries, and a metro system. If your Western Australia itinerary takes you north of or farther inland from the big city, you're probably best off looking for a flight instead of taking a very long bus or train journey. Intrepid travelers often choose to rent or even buy a car and camp along the way on an adventurous Western Australia vacation, although it's worth getting an off-road vehicle and stocking up with plenty of supplies before doing this.